29 November 2003: Annika Billström was elected Mayor of Sweden’s capital city Stockholm in October 2002. Following her election, the new Mayor, who leads a coalition administration of Social Democrats and Greens, said that she would continue to strengthen Stockholm’ position in Sweden and in Europe by pursuing a policy of development, fairness and ecological sustainability. ?Today Stockholm enjoys a strong position internationally and, with its location on the Baltic Sea, is a bridge between eastern and western Europe,? the Mayor told City Mayors. October 2006 update: Annika Billström Social Democrats lost the September 2006 Stockholm elections. The city's new mayor is Axin Olén from the centre-right Moderate party. Annika Billström was born in 1956 in northern Sweden. At the age of 19, she moved to Stockholm to work as an assistant treasurer at the headquarters of the Social Democratic Party. Her childhood experience taught her that, sometimes, life can be really hard. ?That experience gave me a strong will to help. For me come is natural that we, as a society, have to support those individuals who are facing hard times. We also have to take joint responsibility to ensure that every person receives the best possible start in life, no matter his of her background,? the Mayor explained. As Mayor of Stockholm, Annika Billström pursues a policy of growth and development for the Swedish capital. She believes that the city has an opportunity to attract new businesses from within and outside Sweden and to develop into one of Europes most popular tourist destinations. But the Mayor stresses that development will be carried out within a framework of fairness. She told City Mayors that during her term of office her administration will be investing billions of kronor in education and care for the elderly. Mrs Billström has also announced the building of 20,000 affordable housing units. Stockholms already excellent public transport system will be expanded further. The Mayor is also keen to transform the city into a ecologically sustainable metropolis. Together with other cities, Annika Billström is keen to promote strong local government in Sweden, Europe and the rest of the world. Stockholm, with its more than 755,000 inhabitants, is the largest municipality in Sweden. The City Council is the supreme decision-making body of the City of Stockholm. 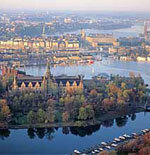 The City provides Stockholms inhabitants with a multitude of different municipal services. Most of the municipal activities in Stockholm are carried out in administrative or corporate form. The City Council is the supreme decision making body of the City of Stockholm. The City Council consists of 101 members, who are elected by Stockholmers who are eligible to vote. Municipal elections are held every fourth year in conjunction with county council and parliamentary elections. In the most recent municipal election held in September 2002, participation was slightly more than 78 per cent. It is the City Council that has the ultimate responsibility for ensuring that the standards of municipal services are equal throughout the city, that laws and municipal by-laws are followed and that the tax revenue is used to best effect. The City Council determines the rate of municipal tax to be levied and the level of fees to be charged, approves the budget and the returns required from each of its respective committees and corporations. As a rule, the City Council meets twice a month and all the meetings are open to the public. The City Executive Board consists of thirteen members, who represent the parties in the City Council. Representation is in proportion to the number of seats held by the political parties in the City Council. The City Executive Board drafts or delivers its opinion on all issues before they are resolved by the City Council. The City Executive Board is also responsible for implementing the resolutions. The parties that have the political majority in the City Council appoint the members of the Council of Mayors. Each of the Citys Divisions is headed by a member of the Council of Mayors (the Mayor and Vice Mayors), who are full-time, professional politicians elected by the City Council every fourth year. Each Division has its own special area of responsibility. The Citys corporations also fall under the Divisions. At present Stockholm has a Mayor and seven Vice Mayors, as well as four Oppositional Vice Mayors. The Council of Mayors is responsible for expressing its opinion, and drafting all issues prior to them being taken up by the City Executive Board. In terms of seniority, the executive officer of the Finance Division takes first place, and he/she assumes the title of Mayor. The Mayor, who is also the Chairman of the Council of Mayors and the City Executive Board, keeps track of important administrative matters, and puts forward proposals on how funds should be allocated in the Citys budget. Annika Billström has been the Mayor of Stockholm since October 2002.